Several efforts have been made to bring a major work by Thomas Wolfe to the movies. October 4, 1953, on NBC, the Hallmark Hall of Fame series aired a portion of the novel Of Time and the River concerning the death of W.O. Gant. Another TV movie was released on NBC February 25, 1972. This time based on Ketti Frings Pulitzer Prize play based on Look Homeward, Angel. The movie was nominated for a Golden Globe award in the category for Best TV Special. On April 25, 1979 CBS aired the TV movie “You Can’t Go Home Again.” It was originally intended to be a pilot for a six-part TV series. One TV Guide reviewer wrote: “They say Wolfe’s genius begged editing, but goodness, CBS must have put You Can’t Go Home Again through a blender. 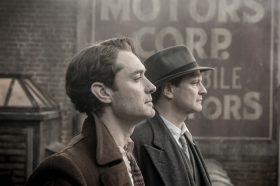 Jude Law and Colin Firth star in the movie ‘Genius,’ portraying novelist Thomas Wolfe and renowned book editor Max Perkins. Have you seen the movie? Do you want to talk about it? That’s what the Comments section is for! Leave us a comment below, and tell us what you thought about the movie Genius. Bottom line: a solid movie, due to its scenes of respect for the reading process and the writing process. This is a movie about New York and Perkins, so no mountain scenes and one reference to Asheville. Good acting from Firth, Kidman, Linney, “Hemingway” and “Fitzgerald.” Zelda came across like a zombie, Aline Bernstein as unhinged (the worst part of the movie). Jude Law miscast; I wished for a Vincent D’Onofrio – someone with BULK. I hope it breaks even financially. At least it’s not another Transformers movie. I saw the movie Genius tonight (June 16) and loved it! My favorite character was that of Maxwell Perkins (Colin Firth), perhaps because he seemed most believable (based on all that I have read about him.) Thomas Wolfe, played by Jude Law, was a little less convincing, perhaps because he seemed a bit over the top in his behavior and his raw emotion. I would have enjoyed it better if he had toned it down a bit. The film makers have done a good job, I think, in compressing so much material into a few hours of screen time, and I liked many of the devices they used, such as the music – Sweet Afton, weaving it into a night club scene as well as Wolfe’s funeral. I liked Julia Wolfe’s portrayal, and all of the Perkins children, but missed having any reference to Wolfe’s siblings. Worth seeing again, after I have looked up some of the details to see if they came from Scott Berg’s biography! Genius is a fascinating look into the working lives and challenges not only of Thomas Wolfe, but also contemporaries like Fitzgerald and Hemingway–and their editor Max Perkins. Jude Law’s wretched attempt at a Southern accent notwithstanding, I enjoyed the movie’s portrayal of deeply intimate–and conflicted–writer-editor relationships. The movie poses an implicit question: is the “genius” of the writing process the author or editor? Reading Wolfe left me thinking he could have used a more ruthless editor; “Genius” revealed that in fact he had one, and made me appreciate Perkins’ genius as an editor and, effectively, therapist. Worth seeing for anyone interested in the writing process. As a novelist, screenwriter, and member of the board of both the Thomas Wolfe Memorial and the Thomas Wolfe Society, here are my comments on the movie GENIUS. That Wolfe and his novels are gigantic is well-known even among many who never cracked one of his books. To watch him cavort with a taller editor and a taller mistress is ludicrous, and gives folks who don’t know Wolfe the expectation of a different person as they seek to know him better. Max was average height. Was Aline tall, skinny, and the same age as Tom? That she was plumb but beautiful and older than Tom is a storied part of their relationship. Is it true that Max never smiled? He was known to smile often. Is it true that Aline was a grim whiner? She was Wolfe’s victim, cursed and ridiculed as rich and Jewish, as her granddaughter’s play dramatizes. Did Aline work in a small time theater as a seamstress, or was she the most sophisticated, celebrated costume designer of her time. Is it true that the author of many passages of light, never really saw the light of day [ref. the eye-squinting late twilight of the film]. Did he collapse alone at the ocean? Did he write to Max from his death bed? Did Max do nothing but cut Wolfe’s work all those years? [By the way, he said Joseph Pennell was the writer he respected most, c. 1948]. Did editor and writer cut the novel while walking the streets? Did New York look back then not at all like New York? Did Max give Wolfe an advance without first signing a contract and later another advance from his own checkbook? OF TIME AND THE RIVER arrived in a crate, yes, [see posed photograph] but four crates, no? Was jazz a major inspiration for Wolfe’s rhapsodic style or were the King James Bible and Shakespeare and classic poets? Does biographical accuracy matter a great deal in a movie, as contrasted with three major biographies? Not always. Does verisimilitude in a movie about editors and writers matter? Pretty much. Even had I never heard of Wolfe, as a writer, indeed as a scriptwriter for Warner Brothers, as an editor and as an agent for many books, I would have felt, almost scene by scene, on the verge of a fit of irritated groaning watching this misconceived, misbegotten travesty. A nap on the afternoon of the June 16th preview of the film GENIUS extended into the evening and I woke too late to claim my ticket at The Fine Arts’ will-call window in downtown Asheville; hence, no comments. A viewing is in my future, but I rented another movie today that has a Wolfe connection, RACE, the story of Jesse Owens. It is set in the years of 1935 and 1936 when Owens was a student at Ohio State and competing for the U.S. Olympic team. The racism in both America and Germany is portrayed as well as the conflict for athletes, members of the Olympic Committee, and other Americans over this country sending a team to Nazi Germany. Participation in the games was seem either as a show of support for, or at least, a blind eye to the Germany government’s bigotry or the chance to defeat athletes of the purity of race espoused by Adolph Hitler. Jesse Owens did choose to compete and won four gold medals. See the movie available at Rosebud on Charlotte Street and from Netflix. I feel like I have waited years to see “Genius” because that is how long it has been since I first heard about the production. The movie includes an uneven portrayal of Thomas Wolfe. I think the set designers captured New York and the Connecticut home of Perkins well. The acting was first-rate, but Jude Law seemed physically to be the wrong actor for the role. The piece that didn’t fit at all was Nicole Kidman who played a truly fictional Aline. Aline was an older woman, charismatic and powerful, but not terrible attractive– according to what I have read. In the letters between her and Tom, she comments on her weight and her looks. Nicole Kidman looked her waifish self, and the screenwriters twisted her character into a mentally unfit woman. The movie did, however, somewhat capture the sad Wolfe saga. If it brings more people to read Wolfe’s writing, then I am happy it is out there. I loved the movie. Having known a few men who were truly manic, I think Jude Law nailed it. Maybe because we live our days now checking in on our collective consciousness with social media, et al, it was a pleasure to become immersed in a time when the commitments to each other were more than tweets and “likes.” I loved the look of it – the sepia tones and soft lighting. The dialogue and the quotes from the books were a treasure. I have not read Thomas Wolfe, but now I intend to.I have recently watched several movies with Jude Law – as Watson in “Sherlock Holmes,” the charming and chauvinistic spy in “Spy,” the paraplegic in “Gataka.” This part really extended his range. The movie was thoughtful and sensitive and a pleasure. Wolfe had a complex, contradictory character. Frugal despite his love of spending, he never threw things away. He was inherently concerned about the existence of things. He had brawny passions: he loved great food, but then he starved himself day after day, almost like fasting, trying to write the great work of his generation. Even further, perhaps mimicking the icons, he partook of the proverbial existential cultural elements of black coffee and cigarettes. He leaned toward alcoholism yet labored many sober days — almost tugging at the delicate balance between life and fantasy — assisting with flowery and descriptive writing in his work. I agree totally with David Madden. Very well written.